“Parklight – Images of Killarney National Park” by Norman McCloskey is the first photography book dedicated to capturing the magic of Killarney National Park. First published in 2013, it is surprising that McCloskey was the first to bring Killarney National Park to coffee tables around the world. It can be quite difficult to explain in words what is the essence of a photography book. However, in this case, the title is the best clue to what awaits between the covers. The ever changing light in the Park makes for an endless display of different views throughout the day and the seasons. ‘Parklight’ does a fine job of capturing the best of Killarney National Park. In his introduction, McCloskey outlines his own story of how he came to know the Park. After getting bitten by the bug that is Killarney National Park, he is surprised that no-one else has produced a photography book with the Park as its subject. Over the course of a three year period, he goes about setting the record straight on that omission. As you immerse yourself in the images in the book, it is clear to see that while working on the book, McCloskey became immersed in the Park himself. A testament to the book is that by merely leafing through the pages, you will find yourself transported to some of the most wild and wonderful corners of Killarney National Park. The book is a beautifully produced tome in the classic ‘coffee table’ format. It’s available to purchase online or from the Norman McCloskey Gallery in Kenmare, Co. Kerry. You can read more about the author and check out some more of his work on his website. This book will appeal to a wide range of people from local residents to first time visitors. Even those who have never been but dream to do so one day will greatly enjoy the book. In my own case, as a native of Killarney, I was enthralled by discovering some places that I never knew existed. Despite spending many days in all corners of the Killarney National Park, there are still pockets where hidden gems are waiting to be found. 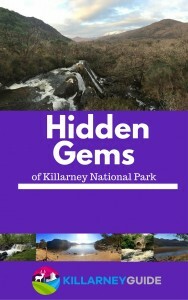 For those that have visited Killarney and the National Park, this book is the ideal memento of your visit. For anyone planning a trip to the Park, you will be spoilt for choice while trying to decide where to visit when you arrive. If you have no plans to visit the Park, well, let’s just say you might change your mind after leafing through the pages of Parklight! Without stating the obvious too much, the photos of the Park are the real stars of the show in ‘Parklight’ There is a huge variety of images and types of images. The photos are clustered together without it feeling too forced. Although it is easy to see seasonal themes throughout the book, it is not presented in a rigid chronological order. There are winter shots and autumnal scenes but they are often grouped by landscape types or even locations within the Park. For example, there is a section on the built heritage of the Park in the book. In this section, there is a lovely image of Muckross Abbey on a snowy winter’s morning. Images are sometimes focused on a particular weather type or an area within the Park. The passing of a day is captured in different ways. The author puts a strong emphasis on the light in the Park at dawn and dusk. This must have meant lots of early starts and long hikes to get these super images. I’m sure that as well as being well-versed in all there is to know about Killarney National Park, the author is also an expert on the best insect repellent on the market! The sunset images towards the end of the book draw the book to a natural close. Despite the fact that this is a photography book, the featured sections are also worthy of a mention. These are short text based sections that give a little insight into particular topics that helped frame the book. The focus on the Red Deer, the built heritage and those people who lived in the harsh uplands of the Park give a lovely flow to the book. The written word further enhances the images and is of the same fine quality. The features have an atmospheric quality to them and really do transport you to those locations as you read through it. Having been to many of these locations myself, I must say that the essence of these spots is perfectly captured in these descriptions. There is a nice balance of some background detail to give perspective, but not too much that it starts to become a guide book. It is not a guide book nor is it intended to be. The stories told in the featured sections are an important addition to help the images come to life even more. Each image comes marked with a location and these are referenced back to a map at the front of the book. The map is great for referencing and anchoring each shot and you can see from the map why the images contrast so much from one end of the Park to the other. If you’ve never been to any of the places featured, Parklight becomes a treasure trove of places you must see. Before you head for the trails, make sure to get yourself a proper map – I don’t recommend lugging Parklight around in your backpack! I stumbled across Parklight after it was featured in the Journal.ie around the time of the publication of the book. An image of Tower Wood in the Park grabbed my attention. The photo captivated me not just because of its beauty but because I had no idea where the photo had been taken. Having grown up in Killarney and spent plenty of time wandering around the Park, my interest was piqued. Not long after, I made some enquiries and made my way to Tower Wood and it is still one of my favourite places within the Park. I am familiar with many of the places featured in Parklight, but that doesn’t take from it in any way. For the places that I haven’t been to, these have all been added to the “must go there” list. The fact that the magnificent resource that is Killarney National Park is within a few minutes’ drive of a bustling tourist centre is often overlooked by many of the visitors that come to Killarney each year. The iconic hotspots that grab most of the attention are surrounded by areas of equal beauty and even more inspiring wilderness. The book brings this across in a powerful way by featuring both but not picking favourites. There is a transformational effect mentioned in the book by the author – his life changed one day while walking the old mass path to Derrycunnihy. Reading the book is transformational too – it will inspire you to visit some of the wonderful places contained within it. At times, the images are like something from a different world and the book serves as a timely reminder of how Killarney National Park truly is a special place. Leafing through the images, you just want to lace up your boots and get out there. Parklight is packed with powerful images throughout its 150+ pages. Everyone will have their own favourites but there are dozens of images that will make you pause and linger as you browse. It is said that there is a different walk for every day of the year in Killarney National Park. Parklight has a similar feel to it and many of the images will inspire you to get out and about to experience these places first hand. And that is where this book will have its greatest impact – inspiring others to explore the Park and bring these images to life. For those not lucky enough to be able to visit Killarney National Park, leafing through the pages of ‘Parklight’ is the next best thing. To find out more about Norman McCloskey and his work, please visit normanmccloskey.com where you can buy a copy of ‘Parklight’ or check out some of his work.